The book is set in Chicago in a dystopian future where the world is divided into five factions who all believe in one single core value. The selfless are in Abnegation, the brave in Dauntless, the intelligent in Erudite, the honest in Candor and the peaceful in Amity. Beatrice Prior/Tris has grown up all her life in Abnegation trying to fit in and be the daughter her parents want but she has never fit in, however hard she has tried. The simulation everyone takes at the age of 16 to help them choose what faction to live in reflects dangerous results and she has been warned to watch out, but for what she will soon find out. When the choosing day finally comes she has to choose between her family and who she really is. This one choice will define her for the rest of her life as the motto of all factions are “faction before blood”. In her new faction the stakes are high. The fights are hard won and it’s everyone for themselves as they compete against each other to get accepted by the faction they choose. Beatrice gets befriended by Will, Christina and Al but can she really trust them? They will all do whatever it takes to pass initiation. Tris will get put through intense physical, mental and emotional training to see if she is worthy to be part of the faction. She also must determine who her real friends are and where a relationship with a sometimes fascinating, sometimes intimidating boy fits into her life. Along the journey she learns what it really means to be brave and learns of the war that is brewing in her seemingly perfect society. She learns that she might have the power to save everyone she loves but will she get herself killed in the process. She will have to figure out how to turn and face the future in a world that’s falling apart. 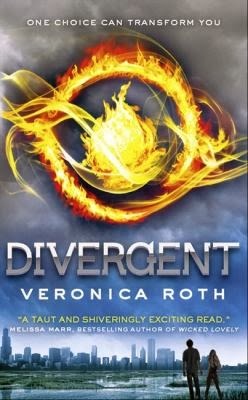 ‘Divergent’ is a heart pounding novel which has many cliffhangers and surprised you with every new page. The characters are very well developed and I got very attached to some of them and hated others. It was very addictive and left you wanting more. It is probably one of my favorite young-adult books. Another good thing was that the main female character was strong and could protect herself because in a lot of novels now teenage girls are portrayed as damsels in distress and always worrying about themselves and their problems. Divergent is narrated by Beatrice Prior who is the main protagonist of the story. It is written in 1st person and told in present tense which really gives you a good insight on her personality and what she is thinking and the things that are going on in her head. I would recommend this book to anyone who loves a good haunting book that leaves you wanting more. I also recommend it to anyone who loves dystopian and science fiction novels, and for people who don’t mind a little bit of romance. It is a great read and very worthwhile. Favorite quote: I would only go to your funeral if there was cake.